Abraham Lincoln is listening to a young man seated on a railroad track. Lincoln’s deep-set eyes look outward, not returning the gaze of the young man. His left hand rises to his face in a speaking gesture, but his smile seems to have frozen – cut off as if by a sudden realization. 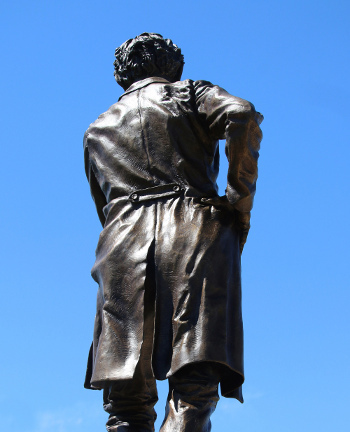 This 13-foot-tall cast-bronze sculpture by Jeff Adams, Lincoln with Boy on Bridge, is the visual centerpiece of Bechtel Park, a pleasant landscaped respite on Second Street in downtown Davenport between the traffic on River Drive and the Arsenal bridge. The sculpture was installed on January 6. The two people are positioned over the outer railroad ties in the sculpture’s base – leaving an open space between the figures in the artwork’s compositional center. The placement of Lincoln off to one side emphasizes that he was not yet a towering historical figure in 1857, when he spoke with the boy on the bridge. The bridge is part of the sculpture’s narrative, but it is also used as a symbol of transition. 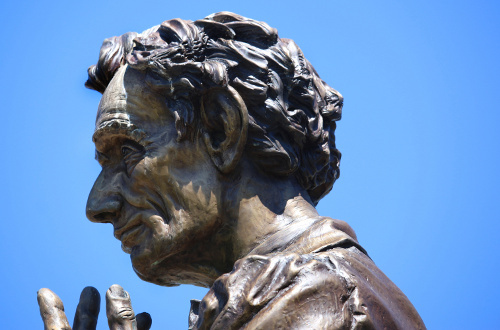 Through this symbolism (the figure in Edvard Munch’s The Scream is also standing on a bridge) and the sense of revelation conveyed by Lincoln’s face, the sculpture subtly expresses that the prairie lawyer stands at a pivotal point in his life. In only three years, he would be elected president – and would be guiding the nation through a cataclysmic civil war soon after. A foreshadowing of this leadership is expressed in the back of the sculpture, where Lincoln’s figure is clearly seen to be in a classical contrapposto pose (with his weight on one leg and the shoulders and arms turned slightly off-axis from the hips and legs) – similar to the heroic stance of Michelangelo’s David. Significantly, the rail tracks on the Arsenal Bridge are directly behind the sculpture. The current bridge is the fourth in a succession of bridges that crossed the Mississippi from Arsenal Island to Davenport. The original bridge, finished April 21, 1856, was the first railroad bridge to cross the Mississippi. Its construction pitted the railroad against the steamboat, Chicago against St. Louis, North against South. Jefferson Davis, then secretary of war and previously a senator from Mississippi, tried to stop the bridge’s construction when he realized it would provide a direct transportation route from East to West, bypassing the South. The railroad would choose an Illinois lawyer, Abraham Lincoln, to lead its defense. Although Lincoln had more than 5,000 trials under his belt, Hurd V. Rock Island Bridge Company would be his most important. His significant role in the landmark trial would bring Lincoln to the nation’s attention for the first time. In September 1857, shortly before the case began, Lincoln traveled to Rock Island to see the site firsthand. He talked with Benjamin Brayton, then 15 years old, after first talking with the bridge master and engineer. According to Brayton’s recollection in 1905, Lincoln approached him after he wasn’t satisfied with the explanations given to him by others. The two of them walked out to the head of the pier, where Lincoln asked questions about the river’s current. He remarked that he understood the situation after their talk and thanked Brayton before leaving. The 14-day trial ended in a hung jury. Yet the 9-3 jury vote against Hurd was, effectively, a victory for Chicago and the railroads. The case was brought before the Supreme Court in 1862, where the bridge owners’ victory was affirmed. The case also was instrumental in creating the first transcontinental railroad; construction on this northern route began in 1863. By then, Lincoln was the president of the United States, and Davis was the president of the Confederacy. Bruce Walters is a professor of art at Western Illinois University. This is part of an occasional series on the history of public art in the Quad Cities. If there’s a piece of public art that you’d like to learn more about, e-mail the location and a brief description to BD-Walters@wiu.edu.